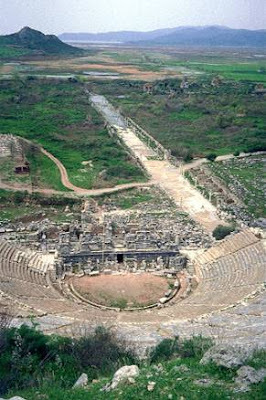 Ephesus was the most important city in the western Asia Minor region (present day Turkey) because it was at an intersection of major trade routes. 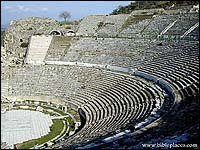 Idolatry was a major economic factor in Ephesus and surrounding areas. Many people made their living through idolatry here. 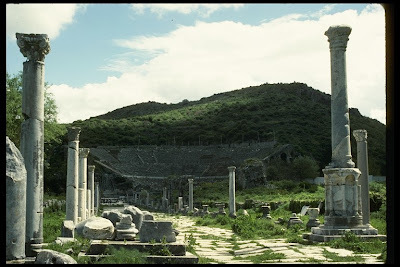 Ephesus boasted a pagan temple dedicated to the Roman goddess Diana (Greek Artemis). 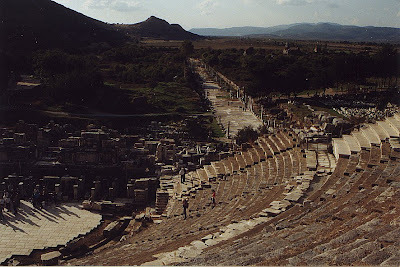 Rabbi Sha`ul (aka Paul) made Ephesus a center for evangelism for about three years, and the church there apparently flourished for some time, but later needed the warning of Rev 2:1–7. Since R. Sha`ul's founding of the churches in the area around Ephesus, believers seem to have won many Gentiles to whom R. Sha`ul's Letter is directed. They were converts from a Hellenistic environment of mystery religions, magic, astrology, etc. They feared evil spirits and weren't sure about Christ's relationship to these forces. They also needed encouragement to adopt a lifestyle worthy of Christianity, free from drunkenness, sexual immorality, theft, and hatred. They also may have lacked respect for the Jewish heritage of their faith. The earliest Greek texts of Ephesians were not actually addressed to the Ephesians. This letter is assumed to be a circular for the churches in the entire area including Ephesus. Ephesians was written by R. Sha`ul around a.d. 60, while he was in jail in Rome or Ceasarea. This letter was sent also with the letters to the Colossians and to Philemon. 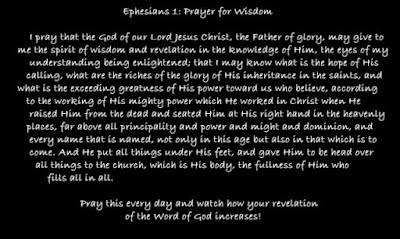 Ephesians is believed to be R. Sha`ul's last letter before his execution. For 18 centuries, R. Sha`ul's authorship of Ephesians was uncontested. In 1845, F.C. Bauer questioned R. Sha`ul's authorship and it has become popular in some circles to deny that R. Sha`ul was the author of this letter and possibly others written by him. Since the author claims to be R. Sha`ul (1:1; 3:1) and personally solicits the readers' prayers, anyone besides R. Sha`ul claiming this would be purposely deceiving the readers -- hardly worthy of a writer who tells us to "put off falsehood and speak truthfully" to our neighbor (4:25). In Philippians, Rabbi Sha`ul tells us he was circumcised on the eighth day, of the Children of Israel, from the tribe of Binyamin, a Hebrew of Hebrews, according to the Torah a Parush (Pharisee). In Acts 22:3 , R. Sha`ul is recorded as saying, “I am a Jew, born in Tarsus of Cilicia, raised in this city (Jerusalem) and trained at the feet of Gamli`el according to the exactness of the Torah of our fathers." Gamli`el I, is also known as “Rabban Gamli’el the Elder.” Gamli’el I was the grandson of Rabbi Hillel, the founder of Beyt Hillel (the more spiritual of the schools of Pharasaic theology). Gamli`el was in turn the leader of Beyt Hillel. He was the first person to hold the title “Rabban,” which means “our teacher,” or “our great one”. In other words, he was the "Rabbi of Rabbis." He is “the Elder” because he was the first of six Rabbinical leaders descended from Rabbi Hillel who were named Gamli`el . Gamli`el was a teacher of the Torah and Rosh Yishiva (head teacher at a Jewish seminary) of Beyt Hillel. Eventually, he became Nasi (leader) of the Sanhedrin. Only the best of the Rabbis went on to receive such a high level of education. Rabbi Sha`ul had the equivalent of a Doctorate in Rabbinical Studies and Rabbinical Literature. Beyt Hillel was the leading school of thought among the spiritual perspective of Pharisaic Judaism, as opposed to Beyt Shammai, the leading School of thought among the mechanical perspective of Pharisaic Judaism. Messiah frequently sided with Beyt Hillel in opposition to Beyt Shammai. This explains the continued attacks against His ministry by the followers of Shammai. Rabbi Sha`ul was educated in the spiritual understanding of Beyt Hillel so he understood the spiritual nature of Messiah's explanation of the Torah. Spiritualists see the Law as a gift from God that when followed leads us to improve our souls. The focus of Beyt Hillel’s outlook on the Law was in how the law effects our souls and draws us closer to God. Beyt Shammai’s focus was exactly the opposite. Shammai's focus was that a persons actions ought to be in accordance with the Law to the letter of the Law. Shammai taught that it was a person's responsibility to "perform" these actions in accordance with the Law specifically as described. A heavenly voice declared: "The words of both schools are the words of the living God, but the law follows the rulings of the school of Hillel." So why does the law follow the rulings of the school of Hillel? The Talmud explains that the disciples of Hillel were gentle and modest, and studied both their own opinions and the opinions of the other school, and humbly mentioned the words of the other school before their own. This spiritual understanding does not imply a mechanical obedience. However, neither does it imply a dis-obedience to Torah either. The Spiritualists view the Torah as a gift from G-d. Each law bringing them closer to G-d. Without the Torah, both sides would agree that this creates a "lawless" state. In Second Thessalonians 2:3, Rabbi Sha`ul describes the end time opposition to Messiah that people call "anti-Messiah" or "Anti-Christ" as "the man who separates himself from Torah" (2Thess 2:3) and as "the one who embodies separation from Torah " (2Thess 2:8). [From:] Sha’ul, by Elohim’s decree, a representative (apostolos) of Yshu`a and thus God in his actions and seeks to advance God’s kingdom. This salutation indicates that Rabbi Shaul was addressing this letter to the entire congregation. 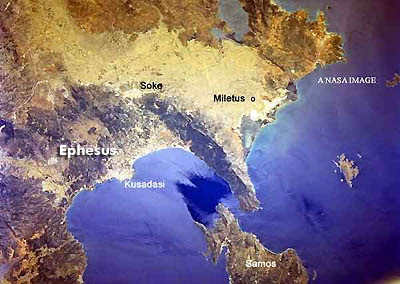 The older, more reliable manuscripts do not contain the words “in Ephesus.” Origen did not have the city name here and Marcion claimed that it was written to the Laodicians. Also, there are no references to particular individuals. Thus, it is very possible that it was not specifically written to the Congregations in Ephesus. In fact, it may have been written much like a form letter with the carrier inserting the name of the city in which he was reading it at the time. When the complete body of Greek texts are examined, there is little evidence to support the idea that this letter was specific to the Ephesians. However there is little doubt that Ephesus was one of the cities where this letter would be read. that this letter was addressed to the general populace of the various congregations. We do not see as much use of complicated rabbinics as we see in Shaul’s letters addressed to the "ekklesiai" the Rabbinates of various cities. their salvation and become damned. He discusses this more obviously in Hebrews 10:26-29. The use of “kurios (Lord)” here looses meaning in translation from Rabbi Shaul’s native Hebrew into Greek and then into English. “Kurios” is used in Greek to translate the Hebrew word “Adonai,” as is the English “the Lord.” This Hebrew word is not simply a title, it is one of the two euphemisms used for the Tetragrammaton, the four-letter name of God. As such, it is a proper noun referring to God the Father. From the rabbi’s point of view, this is a reference to the divinity of Yshu`a HaMashiach. The Greek word “(eulogesas)” translated here as “blessed” as well as the Greek word "(eulogia)” translated here as “blessing” both refer to good things being said. This indicates a Jewish concept that goes back to Genesis, chapter one and is carried forward. God’s words have power and it is through His words that all things are accomplished. things came to be through Him, and without Him nothing made had being,” John 1:3.